The highly infectious disease, is transmitted through the air, can lead to pneumonia, encephalitis, and sometimes death in children. In 2000, the US Centers for Disease Control declared it eliminated in the United States, thanks in large part to an effective vaccine. But because of anti-vaccination hysteriamany parents have opted out of vaccinating their kids, leaving them vaccinated, vulnerable, and spreaders of the disease. 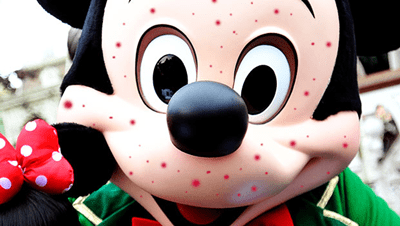 Measles rates have risen dramatically over the past few year, the CDC reported record numbers in 2014, due in large part to gaps in vaccinations. This is what happens when you take medical advise from Jenny McCarthy. I read that there were 600 cases last year in the USA, and each case costs $33,000 to treat. Can we send Jenny this bill, please?